The House Clinic has a well-deserved reputation for excellence in otology and neuro-otology. It was with great expectation that I turned the first page of a book labelled ‘The House Clinic Atlas’. The atlas starts with a poignant moment, as the foreword is written by William F House, who sadly passed away in December of last year. In it, he details the history of the introduction of microsurgery of the ear. The first microscope used was a modified colposcope, which his brother Howard P House brought across after a trip to visit Professor Wullstein in Wurzburg, Germany. In some ways, the House Clinic being close to Hollywood helped, as there were many optical companies connected to the film industry, and a long-standing partnership with Jack Urban was born. The book itself is concise, with little over 200 pages of text and illustrations. The chapters start at the ‘orbitozygomatic craniotomy’ and move on to the Fisch type approaches, via the translabyrinthine and trans- cochlear approaches. Each chapter covers some basic anatomy. There is a section on surgical technique, which includes variations of the operation. The chapter finishes with complications and technical pearls. The illustrations by Mark M Millar are clear. There are accompanying videos, which can be accessed online and are useful, but these do not add much to the text. This atlas of lateral skull base surgery is the distillate of years of surgical experience at the House Clinic. In this book, the authors of the next generation share their continued experience of the surgical management of skull base lesions. 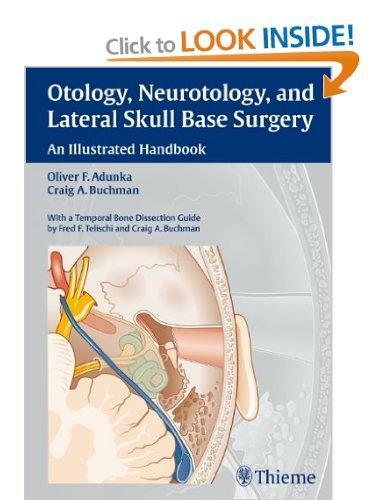 As a concise atlas, the text cannot give the reader step by step directions for surgery, but I would recommend it to all trainees looking to gain an overall view of this field of otology.